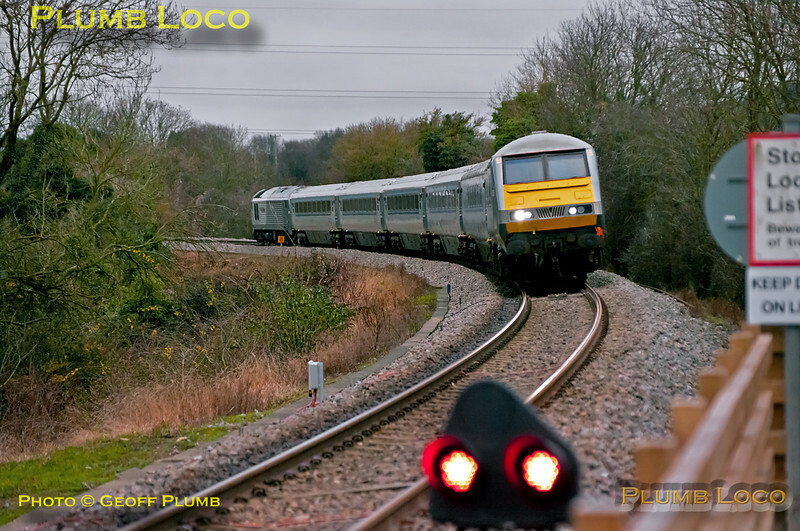 Chiltern ran some extra Loco-hauled services on Friday 23rd December 2011, though this is one of the normal services. 82305 leads 1R14, the 08:37 from Marylebone to Birmingham Moor Street, with 67012 "A Shropshire Lad" providing the power on the rear. The train is approaching Princes Risborough on the 1 in 88 descent from Saunderton summit, where the up and down lines are grade separated. The ground signal in the foreground denotes the limit of shunt on the down line from Princes Risborough. 09:05 on a very dull morning - it didn't get any better throughout the day! Digital Image No. GMPI10718.